This is the same Maze family Sallie Hyde. Launch day! Sallie Hyde backing into the Merrimack River in Amesbury, MA. 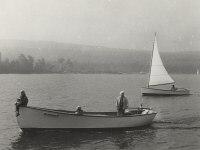 James Maze Royston, grandson of James Maze, aboard his newly restored Sallie Hyde. 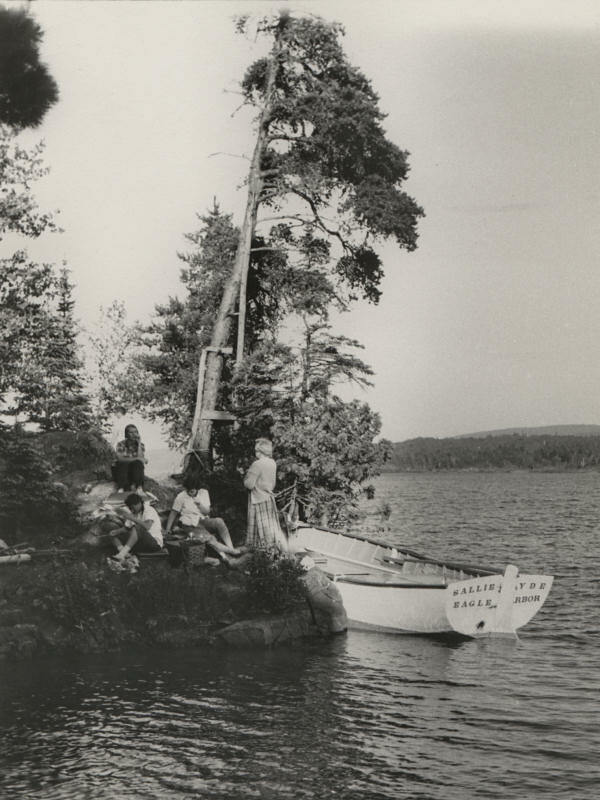 July 2016 - Sallie Hyde has once again found her home in Eagle Harbor on Lake Superior! The long process has finally come to an end. Now, time to enjoy her! Maze Goff, at the tiller of her great, great grandfather's 1948 sea bright skiff! 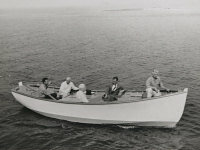 In 1967 Laude Hartrum II, then a canoe manufacturer based in Hebron Illinois obtained plans for a Sallie Hyde boating magazine and decided to make one with a fiberglass. It was refitted in 2015-2016 at Patterson Marine in Pentwater. The superstructure, decking and most of hardware were removed. New decking, center console, hydraulic steering, gas tank, rudder and prop were installed. The engine, a Ford 4 cylinder 55 hp was installed after at "Charlies Marina" in Pentwater. The boat was launched in July 13, 2015 and on July 16, 2016 my Dad went for the first ride on his boat in 38 years at the age of 86. We had to carry him onto the boat and off the boat. All the wood working was done by Greg Harrision of Ann Arbor, Michigan in the winter of 2015-16. The deck is "Ibe" the console, seats, etc are oak. Laude Hartrum II is now 87 years old (2017) and after almost 30 years he went for a ride on his boat last July for his birthday.Laude's son uses the boat every once in a while for work to ferry people to and from scenes, check mooring buoys, etc. In 2016 the boat was used to ferry USCG personnel during a search and rescue operation off Little Point Sable in Oceana County. The boat handles the waves of Lake Michigan 6-7 ft.well and is very stable. First named the "Elin-J" the boat has been renamed "Defiant". The name befits a boat that defies the odds and has returned to second useful life on Lake Michigan.